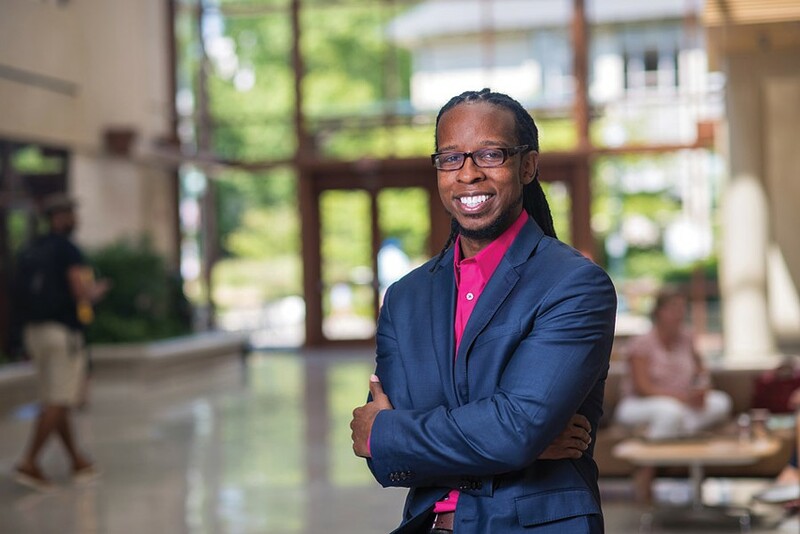 Author Ibram X. Kendi argues that racist ideas, used to justify racist policies that are created out of economic and political self-interest, produce ignorance and hate, not the other way around. He also identifies a group between segregationists and anti-racists: Assimilationists, as he calls them, are well-meaning people who don't think they are racist and who fight inequality, yet still in part blame those who are oppressed for their plight. Kendi, a professor of history and international relations at American University, provides historic evidence for these ideas in his brick of a book, "Stamped From the Beginning: The Definitive History of Racist Ideas in America," which won the 2016 National Book Award for Nonfiction. The 600-page work frames the origins of those ideas and the push and pull between action for equality and the racist policies made in response through the eras of five historic figures, from Cotton Mather to Angela Davis. He'll visit Rochester on Thursday, November 30, to give a talk and sign copies of the book at Monroe Community College. In a phone interview with CITY, Kendi said that "Stamped from the Beginning" shows not only a simultaneous chronicle of racial progress and anti-black discrimination, but "a dueling history in which both those who are trying to make racial progress and those who are trying to make racist progress are fighting for the soul of America." Kendi points, for example, to the election of Barack Obama, which drew an unprecedented number of people of color and young people to the polls, but also led to a more sophisticated set of suppression policies in the form of a proliferation of voter ID laws justified by the concept of the corrupt voter. The seeds of Kendi's meticulous chronicle are found in 2012 — and true to his thesis, this was a time when the dream of racial progress was symbolized by Obama's reelection, but a series of killings of unarmed black people by law enforcement officers was starting to gain national attention. The bigoted celebrity who would follow Obama in office was leveling attacks about the president's birth certificate, and some Americans insisted that the black victims of police violence must have done something to deserve it. Simply put, Kendi argues, racist ideas are used to pull our focus away from policies that are the true cause of the inequities we see. During an interview on "The Tavis Smiley Show" in late-2016, Kendi said that there's only two ways to explain racial disparities: "Either there's something wrong and inferior about black people, or there's racial discrimination. And because so many Americans refuse to acknowledge the persisting legacy and enduring prominence of racial discrimination, instead they say there's something wrong or inferior about black people." To create genuine and lasting progress, Americans need to identify and disassemble systemic racism, Kendi says. For example, the 13th Amendment abolished chattel slavery, but it legally allowed for slavery to continue in the case of imprisonment. And the mass-incarceration of black and brown people creates mass-disenfranchisement in states where felons aren't allowed to vote. Kendi says that one reason Republicans continue to push mass incarceration, even as the country begins to turn against it, is because of the political gain they accrue from it. Disenfranchisement of one-in-four black men in Florida, he says in example, has made it a swing state, when it otherwise would be blue. "I think that people are starting to realize that the racial inequities in their communities are actually not normal, are not the fault of 'inferior' black people," he says. And that's causing people to look for the discriminatory policies at the root, and driving a larger racial justice movement in the country. Kendi points to the leaders of the Black Lives Matter movement as examples of genuine anti-racist advocacy. "There's a disproportionate number of black people who are being killed as result of racist ideas, and their killers are being freed as a result of racist policies," he says. Unlike the "Blue Lives Matter" group who imagine that there's a war on cops — which is not statistically correct — or those who say "All Lives Matter," BLM activists are not saying that black people are the problem, "just like they're not flippantly saying that cops are the problem without describing that within the context of a racist criminal justice system." Black Lives Matter and the subsequent Take a Knee movement have raised discussion about police violence to a national level. But both movements are vulnerable to distortion, Kendi says. The reaction to Colin Kaepernick and others taking a knee "has misrepresented what they were doing, and stated that they were basically disrespecting the flag and the troops, and then they critiqued the misrepresentation," he says, adding that this strategy of misrepresenting anti-racist protest has a long history. For example, during the Civil Rights Movement, segregationists stated that Civil Rights activists were outside agitators seeking to eliminate the positive, friendly relationships between the races in the South, and that they were against states' rights. "The critique of Black Lives Matter as anti-cop is indicative of the critique of those who are opposed to Confederate monuments as anti-South," Kendi says. "Neither of which are true." Kendi is currently writing his next book, "How to Be an Anti-Racist," which he says is a memoir of his journey toward antiracist thought. "I try to not only talk very deliberately about what it means to think and act as an anti-racist, but I also try to take the reader to that point of understanding through a series of steps. And those series of steps are really stories in my life and my own personal evolution." He's also the founding director of the in-progress Anti-Racist Research and Policy Center at American University, which will soft-launch in the spring and hard-launch in the fall. The center will primarily focus on "creating knowledge for change's sake, uncovering discriminatory policies, developing corrective egalitarian policies, and executing innovative campaigns of change to get those policies instituted," Kendi says. It will be organized around six areas — education, economy, environment, health, politics, injustice — and will draw leading scholars, policy experts, journalists, and advocates who will work together on everything from discovering inequity to instituting egalitarian policies, he says.